The bathroom is perhaps the most heavily trafficked room in any home; it must serve a variety of masters and the components must perform well under demanding conditions. High humidity and ever-present moisture can wreak havoc on bath textiles; mold and mildew are the enemies. One way to take charge is by using laundry and clothing hampers to store a variety of supplies such as clean towels, soiled clothing, bath toys and more. 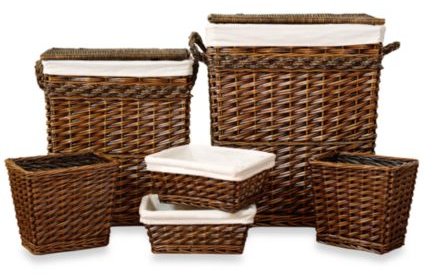 Most hampers are designed to withstand heavy use and hold up in moist conditions which is why they are ideal for use a in a bath or powder room. A plastic hamper is perfect for storing bath toys and can help keep clutter in check. Laundry is easier when the soiled towels and clothing are tossed into a series of hampers sorted by color or clothing type and kids can be taught to pitch in and help. Perhaps one of the handiest improvements anyone can make in a bathroom is to install a handheld showerhead; typically these units are designed so that a homeowner can do the job without calling in a plumber. With a handheld showerhead it is much easier to shampoo hair, bathe children and pets, water plants and clean the tub or shower stall. Another great addition to any bath is a heated towel rack or towel warmer. There are many makes and models – a small bathroom might be best suited for a counter top towel warmer; there are wall-mount and freestanding floor units as well. Towel warmers not only make towels cozy and warm; they are great for drying fine washables and warming baby clothes.